Arsenal finished its tour of the United States with a comfortable 3-1 victory over Club Deportivo Guadalajara (nicknamed “Chivas,” as you may or may not know) in Los Angeles. Arsenal used a different starting lineup than appeared against the MLS All-Star squad. The (US preseason tour) first choice back four of Hector Bellerin, Rob Holding, Calum Chambers, and Nacho Monreal started the match ahead of David Ospina. Granit Xhaka and Francis Coquelin gave a preview of our big-match double pivot, with Alex Oxlade-Chamberlain, Santi Cazorla, and Alex Iwobi in front of them. Theo Walcott manned the center forward position. The match began like a terrible preseason match. Chivas are not very good and Arsenal were very sluggish. The Gunners could barely keep the ball with passes being routinely misplaced and touches failing them. They were putting on a terrible show for Mesut Özil, who cut his vacation short to watch his buddies horse around. Despite that Chivas rarely threatened. Their biggest chance came when Holding passed the ball straight at a Chivas attacker. Instead of attempting to take on an isolated Chambers, the attacker decided to shoot, straight at Ospina. Arsenal opened the scoring with a 34th minute goal by new boy Rob Holding. Cazorla lofted a free kick towards the back post to Chambers who squared the ball back to the former Bolton starlet who tapped in easily. If their goal celebration was any sign, it appears Arsenal have another young English player bromance brewing. The match immediately turned into a cliche after the Arsenal goal. The Gunners flipped a switch and began dominating proceedings. Arsenal should have doubled their lead two minutes after the goal when a spectacularly weighted Xhaka pass found Monreal who squared back to Walcott. Unfortunately, Theo’s shot was well-saved. In the 40th minute, Oxlade-Chamberlain skipped past three Chivas defenders, only to shoot straight at the keeper left-footed. The young Englishman probably should have passed instead of shot, but his run earned the opportunity to take a chance in a preseason friendly. Xhaka once again displayed his impressive touch and passing technique in the 42nd minute, in a beautiful exchange with Cazorla which culminated in Santi crossing back for literally any attacker (paging Theo) but no near post run was made. As should be expected in a preseason match, Mohamed Elneny, Chuba Akpom, Joel Campbell, Mathieu Debuchy, Krystian Bielik, and Kieran Gibbs came on at halftime for Granit Xhaka, Theo Walcott, Santi Cazorla, Hector Bellerin, Calum Chambers and Nacho Monreal, respectively. Arsenal started the second half brightly and extended their lead in the 50th minute through a brilliant goal from Oxlade-Chamberlain. 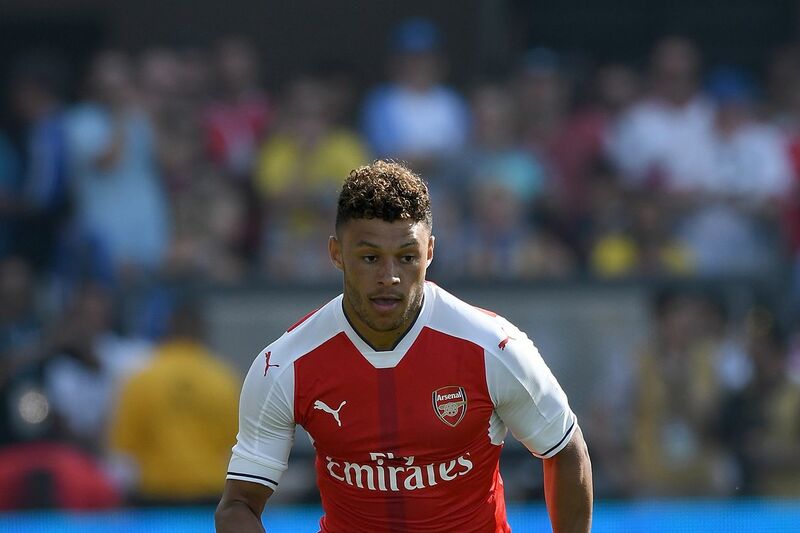 The Ox drove down the right flank, executed a perfect backheel to his left boot and curled it into the far corner. It was a goal worthy of a Messi or Ronaldo, continuing the trend of Ox looking like a star in preseason. Let’s all hope he brings some of the form with him into the season. Arsenal then put the match out of reach in the 56th minute. Coquelin played Debuchy through down the right flank. The second-string right back cut the ball perfectly back to Akpom who outmuscled a Chivas centerback while finishing cleanly. Like Ox, it was Akpom’s second goal of the preseason. Arsenal brought on the youngsters in the 65th minute with Gedion Zelalem, Chris Willock, and Jeff (JEFF) Reine-Adelaide coming on for Francis Coqulein, Alex Iwobi, and Alex Oxlade-Chamberlain. The Artist Formerly Known As Damian, Emiliano Martinez, came on for Ospina shortly thereafter. Chivas garnered a consolation goal through the generous Debuchy in the 74th minute. The Frenchman decided to level the Chivas winger, rightfully adjudged a penalty kick. Debuchy was lucky not to be carded for the foul or for bumping the referee and getting in his face after the call. After the Chivas goal, Arsenal lost their way, struggling to hold onto the ball. Chivas threatened but could not break through. Proceedings did get testy at the end, as both sides committed a number of cynical fouls. It resulted in a lot of feather-strutting by Campbell and some Chivas players in the 89th minute, but the situation was eventually diffused. Overall, Oxlade-Chamberlain, Cazorla, Xhaka, and Elneny performed very well. Coquelin was horrid in the first-half, but redeemed himself with a solid, ten minute second-half performance. Debuchy was terrible, even with the assist, and was lucky not to be sent off. He was consistently targeted by the Mexican side and was shown lacking. If he does get his desired move away this week, that was an ignominious end to his Arsenal career. Arsenal play next on Friday, August 5th, against Viking FK in Stavanger, Norway.